Brown sugar, molasses, candied fruit, and spices bring the holidays into this beer. No, the name of this beer doesn’t refer to a psychedelic band from the 1960s, although that would be awesome. This beer was born out of an annual tradition on Basic Brewing Video. In December of 2007, I brewed a small batch barleywine for Steve Wilkes to use in making a fruitcake and a wassail – a traditional holiday beverage. The barleywine from the next year went into a bread pudding. All of the above were delicious. In 2009, I decided to turn the tables. Instead of using barleywine as an ingredient in fruitcake, I decided to see what would happen if I used traditional fruitcake ingredients in the beer. (See recipe and video below.) The beer was based on one brewed with American two-row, 90L crystal, and a bit of aromatic malt with Fuggles for bittering. In addition to the standard beer ingredients, into the brewpot went brown sugar, molasses, roasted pecans, candied pineapple, candied mango, and candied papaya. At the end of the boil, cinnamon, ginger, cloves, and nutmeg joined the holiday party. 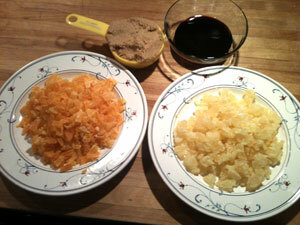 Candied pineapple adds flavor and raises the specific gravity. The first time I brewed this beer, I was almost knocked over by the smell of the spices in the brewpot. I assumed I had ruined the beer by adding too much, and I was glad that I was making less than a gallon. However, the finished beer was nicely balanced and delicious. It surprisingly hid its 12.7% alcohol by volume, and the spices played well with the base flavors from the malt and sugars. Even two and three years later, the beer held up very well and was a favorite of ours until it was gone. Scarcity is one of the drawbacks of small batch brewing, so this year I decided to revisit the recipe and ramp it up in volume to two gallons (7.5 liters). In the original batch, a two-gallon beverage cooler served as my mash tun. This time, I employed Brew-in-a-Bag (BIAB) techniques and my electric smoker to maintain a constant mash rest temperature. My five-gallon (19-L) kettle fits right into the smoker, which I set at the mash temp. I couldn’t find candied papaya this year. I decided to increase the amount of the mango and pineapple by 50% to compensate. I also decided to forego the roasted pecans. It seemed the nuts did little but bob on top of the wort in the kettle, and I didn’t get any nutty character from the final beer in the first version. I replaced the Fuggles in the original recipe with a smaller dose of Magnum for bittering. The Mr. Beer fermenter’s wide opening allows easy access. For the fermenter, I went with the plastic Mr. Beer keg fermenter. It’s great for two-gallon batches. 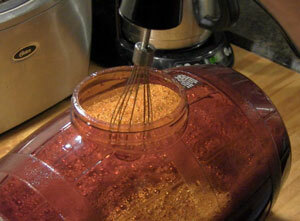 I aerated using a hand blender with a sanitized whisk attachment. Safale US 05 did well in the original beer. This time, I used a full pack and hydrated it before pitching. I figured it needed all the help it could get with the 1.101 original specific gravity. At the time of this writing, the beer is happily fermenting – two days after brewing. The aroma coming from under the lid reminds me of the holidays and makes me impatient for the beer to be ready. Stay tuned . . . Using the Brew in a Bag method, I mashed the grain with 14 quarts (13.2 liters) of water at a single infusion rest of 150˚F (65.5˚C) for an hour. Removing the bag (and squeezing it) gave me a pre-boil volume of three gallons (11.3 liters). I have to try this! Ever think of subbing Special B for the C90? Might give more of a raisin-ey character. It’s worth a try. Let us know if you do it. Cheers! Do you mash the brown sugar, add it to the boil? Or just throw it in the fermenter? Boil that dust speck. . . I mean, brown sugar. And all the other stuff. Part of the worry about robots gaining power and taking over is them replicating themselves! Today is another first. Two fruitcakes making another! Thanks for the idea for next year! I bet this would be delicious with some cherries in the mix too! Though I think it would be safe to leave out whatever those mystery green blob things are in fruit cake. Do you have problems with way more haze than usual when you do BIAB? I guess it doesn’t matter for something this dark, but my session rye BIAB was absurdly hazy. I normally don’t mind haze, but this was off-putting even to me. There is more trub in the kettle with BIAB since it doesn’t have the benefit of the filtering action of the mash tun. However, I find my BIAB beers clear up similar to traditionally mashed beers. Cherries would be a good addition, too. Thanks for the great ideas , just starting my version of the the fruitcake barleywine with a some of my own craziness some star anise , mixed peel and a little glacé ginger see how we go. Cheers from down under . Wow. Let us know how it turns out! where did you find the candied fruits i have a hard time getting my hands on it. and what temperature did you ferment? I found the fruit in the “natural” snack section of the supermarket. I’m fermenting at around 68˚F. I think this sounds good, especially in the small batch size. I have a couple 5-gal and 3-gal Better Bottles just sitting around. Do you think it will be good by Christmas of this year, if I brew it soon, or does it need a full year or more to mellow? I’m also thinking of aging it with some brandy-soaked oak. (Keepin’ the fruitcake theme going! — Or should that be rum?) I have a couple of the Black Swan honeycomb pieces to try out. I think it will be good by Christmas, and I like it fresh, too. I like the idea of adding some brandy soaked oak. Let me know how it turns out. I’ve brewed this three times now. Tasty each time. Let me know how yours turns out if you try it. How long do you ferment the beer and do you do a secondary?